Feeding Goldfish the correct amount of food is a delicate balance between feeding the minimum amount required for health and growth, but not starving or overfeeding. There are many answers given to the often asked question “how much do I feed them?”. This is an important question because poor feeding creates many problems that cause Goldfish disease and often death. Answers to the question range from the size of the eye to what they can eat in 2 minutes. Goldfish have a rudimentary stomach. They can’t eat food like an alligator that swallows a large meal and then may not eat for another 3 months. Goldfish browse continuously which is why they always appear to be hungry and looking for food. If we use the size of the eye answer, that is one mouthful for a Goldfish. That isn’t enough food, especially if you’re expecting your Goldfish to grow. Your fish should appear plump and rounded after feeding. Goldfish need time to process their food. Goldfish cram as much food into their mouths as possible, chew, swallow, and then come back for more. They will repeat this cycle many times before they start to slow down as their digestive tract fills with food. The problem is, many dry foods start to dissolve if they aren’t eaten quickly, so the owner only feeds what their fish can ingest in a few minutes to avoid polluting the water. Goldfish should be fed between 0.5 to 2% of their body weight in food daily. The higher amount would be in the warmer months when their metabolism is higher, and you're feeding your fish for fast growth. To achieve this level of feeding, you need a food that is easy to swallow, won’t pollute the water, and won’t lead to digestive problems. Gel foods tick all these boxes. Gel foods are soft and moist, similar to natural foods so are easy to chew and swallow. Hungry Goldfish tend to gulp down their food causing digestive problems if the food is dry. How many YouTube videos are there showing fish bouncing around their aquariums like corks shortly after feeding? Many dry foods have a high ash content (material used to bulk out the food) and some protein sources are not the most ideal. Gel foods hold together longer in water, giving the fish more time to find them. My fish don’t give the gel food time to dissolve because they swallow it so fast. Commercial gel foods come as a powder and so have to be made into a gel. This entails adding a little water, bringing it to the boil, stirring, and letting it cool. You can make up batches that will keep in the fridge for two weeks. The smell generated when cooking and cooling takes getting used to. After gelling there is little smell. 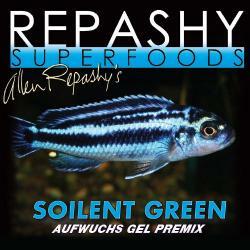 I use and recommend Repashy Soilent Green gel food. Repashy Soilent Green isn’t specifically made for Goldfish but for fish that are omnivorous (which Goldfish are). Many of the larger Goldfish dealers now use Repashy’s instead of dry foods or their own gel food mixes. Soilent Green has a good mix of protein and green matter plus many other essential vitamins and minerals. Feeding Repashy’s allows larger amounts of food to be fed with a lower risk of water pollution and no risk of digestive problems. I have been feeding my fish Repashy Soilent Green for 19 months now and still haven’t had a single swim bladder problem. It can be inconvenient going to the fridge and finding I need to make some more up, but the advantages I have had with this food ensures I will never go back to dry food again.